Chris Colin and Rob Baedeker Tips from a comedian and a journalist on the art of going from small talk to big ideas all summer long. Imagine almost any situation where two or more people are gathered a wedding reception, a job interview, two off-duty cops hanging out in a Jacuzzi. What do these situations have in common? Almost all of them involve people trying to talk with each other. But in these very moments where a conversation would enhance an encounter, we often fall short. We can't think of a thing to say. Or worse, we do a passable job at talking. We stagger through our romantic, professional and social worlds with the goal merely of not crashing, never considering that we might soar. We go home sweaty and puffy, and eat birthday cake in the shower. We stagger through our romantic, professional and social worlds with the goal merely of not crashing, never considering that we might soar. We at What to Talk About headquarters set out to change this. 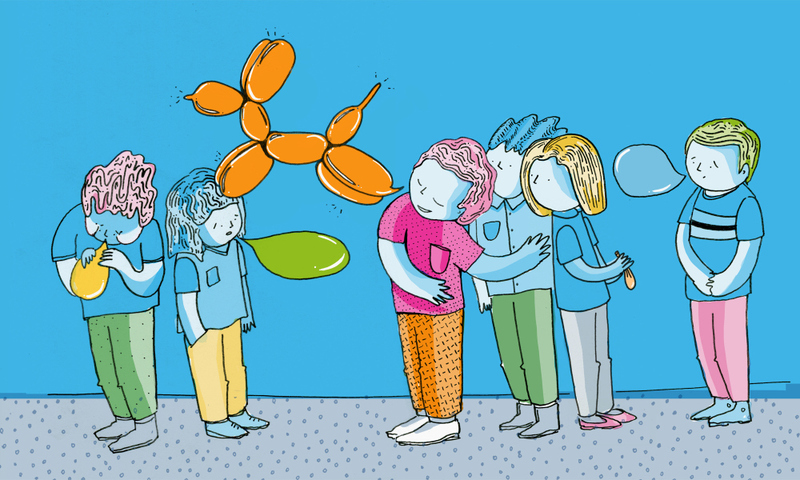 Below, a few tips for introverts (and everyone else) on how to turn small talk into big ideas at the next Social Obligation Involving Strangers: Ask for stories, not answers One way to get beyond small talk is to ask open-ended questions. Aim for questions that invite people to tell stories, rather than give bland, one-word answers. Instead of "How are you?" "How was your day?" "Where are you from?" "What do you do?" "What line of work are you in?" "What's your name?" "How was your weekend?" "What's up?" "Would you like some wine?" "How long have you been living here?" Try "What's your story?" "What did you do today?" "What's the strangest thing about where you grew up?" "What's the most interesting thing that happened at work today?" "How'd you end up in your line of work?" "What does your name mean? What would you like it to mean?" “What was the best part of your weekend?” “What are you looking forward to this week?” “Who do you think is the luckiest person in this room?” "What does this house remind you of?" "If you could teleport by blinking your eyes, where would you go right now? "Break the mirror When small talk stalls out, it's often due to a phenomenon we call "mirroring." In our attempts to be polite, we often answer people's questions directly, repeat their observations, or just blandly agree with whatever they say. Mirrored example: James: It's a beautiful day! John: Yes, it is a beautiful day! See? By mirroring James's opinion and language, John has followed the social norm, but he's also paralyzed the discussion and missed a moment of fun. Instead, John needs to practice the art of disruption and move the dialogue forward: Non-mirrored example: James: It's a beautiful day! John: They say that the weather was just like this when the Japanese bombed Pearl Harbor. If that actually happened. See? Now James and John are talking! Be provocative. Absurdity is underrated. Leapfrog over the expected response An even better way to break the boring-conversation mirror is to skip over the expected response, and go somewhere next-level: Instead of: Ron: How was your flight? Carlos: My flight was good! Beverly: It's hot today. Gino: Yeah, it sure is hot. Riz: What's up? Keil: Hey, what's up? Try: Ron: How was your flight? Carlos: I'd be more intrigued by an airline where your ticket price was based on your body weight and IQ. Beverly: It's hot today. Gino: In this dimension, yes. Riz: What's up? Keil: Washing your chicken just splatters the bacteria everywhere. Go ahead, be bold. Upend the dinner table conversation! Turn small talk into big ideas at the next summer wedding reception you're forced to attend! You never know which ideas will be worth spreading next.